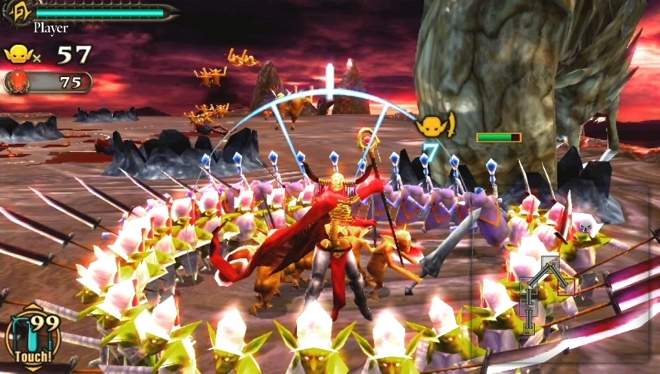 Use an army of tiny soldiers to take down the undead in Army Corps of Hell on PlayStation Vita. CHIBA, Japan — Did you enjoy Nintendo’s action-strategy game Pikmin but wish that it had more blood, guts and heavy metal music? Then Army Corps of Hell may well be your game. Square Enix will launch this game when the PlayStation Vita arrives in Japan on Dec. 17. As soon as new owners of Sony’s powerful portable game machine start this launch game up, they’ll be reminded of Pikmin . Both games put you in the role of a leader of a small army of tiny critters that you fling around at enemies and food items, watching them attack and eat while protecting them from harm. Where Army Corps of Hell breaks from its inspiration is that the game takes place in the underworld, with gore-splattering fights against all kinds of grotesque creatures. Some tweaks to the gameplay make it more than just a clone. As you’re flinging your tiny followers onto an enemy, a counter will start to go up. Once it fills (usually when you’ve got a round 10 or 20 of the little buggers chomping away), it’ll light up and you can press the attack button with good timing to make them jump off the enemy and raise their swords in unison, then stab them back down. It’s pretty easy to get the timing down and do extra damage. Otherwise, the gameplay demo at Tokyo Game Show was pretty simple — use the Vita’s two analog sticks to walk and control the camera, strafing around your enemies and making sure to avoid their attacks while chipping away at their energy. After an enemy dies off, you can set your crew of soldiers to eating their corpse to get bonus items and extra health. If you need to raise your health up, you can use a potion to play a mini-game in which you “drum” on the Vita’s rear touchpad to boost your spirits with percussion. If your soldiers are hit, they’ll fall down and a white skull will appear over them. If you can walk over them before the skull turns black and fades away, you’ll revive them. Otherwise, you’ll have to wait until you come across a cage, in which you can trade in the red gems you’ve picked up for more followers. The end of the level featured a fight against a large boss creature, which was somewhat more complex; I had to attack his legs to make him drop to his knees before we could stab his head. Square Enix has not unveiled any U.S. launch plans for Army Corps of Hell as of yet, but I wouldn’t be surprised to see the game arrive here very close to Vita’s launch.